During the holidays, people will be out enjoying parties a little more often. The police, (rightly so) will also be conducting more frequent roadside sobriety tests. Imagine that you have not had a drop of alcohol to drink. You are stopped at a roadside check and the officer asks you to roll down your window. Out wafts the smell of bourbon — from your car’s air freshener. Yes, you too can have the smell of drunk driving without driving drunk. 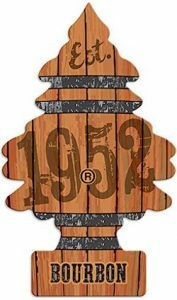 Just hang a few of these little bourbon scented trees around the inside of your car. I might consider this for a bar or lounge area, but a car? No. Not really a good idea. The Jimmy Dean sausage company holds a recipe exchange during the holiday season. Readers submit a recipe that uses Jimmy Dean sausages and they get to select one of the limited-edition keepsakes the company offers. This year, one of the keepsakes was sausage scented gift wrap. I have a dog. Not one thing wrapped in sausage scented gift wrap would last more than 30 seconds. If any of the gift wrap was swallowed, it would be an expensive visit to the veterinarian. 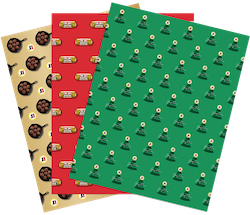 For anyone who has pets, unscented and recyclable gift wrap would be the best option. You’ll have plenty of sausage scent when you cook sausages for breakfast Christmas morning.